EA has slowly been rolling out the top 100 rankings for FIFA 19. Now all of them have been revealed, including that illustrious top 10. The results are in! Here are the top 10 rated players in FIFA 19. Cristiano Ronaldo (Juventus):The FIFA 19 cover star’s career has been packed with awards and trophies, but after his high-profile move to Juventus this season, it’s clear that Ronaldo isn’t done racking up silverware. The Portuguese forward continues to play like the world’s best, and his ratings are evidence of an astoundingly talented player. Ronaldo beats defenders left and right when attacking, burning them with his 90 Pace and bamboozling them with a 90 Dribbling rating. But the most complete forward in football stands above the rest with a 93 Shooting rating, evidence of a natural finisher who puts away more chances than he misses on a regular basis. Lionel Messi (FC Barcelona):Still going strong after years of breaking records and winning trophies, the Argentine attacker is undoubtedly one of the greatest to ever play the game. Messi’s talents and skills make him extremely versatile; 96 Dribbling shows why his technique is the best in the world, and his 88 Passing rating gives him a playmaking ability that few others even come close to. Combine that with the 91 Shooting rating and it’s easy to understand why Messi has broken nearly every possible goalscoring record. It all adds up to the recipe for a true football legend. Neymar Jr (Paris Saint-Germain):The samba master has made an even bigger name for himself since moving to Paris Saint-Germain, where his signature Brazilian flair is on display every week. Neymar Jr. is effective in any attacking role, thanks to his stellar ratings in nearly every major category, but his 92 Pace and 95 Dribbling are what make him the paramount left winger in the world. Luka Modric (Real Madrid):The reigning World Cup Golden Ball winner has been highly regarded for a long time now, but his recent successes have catapulted him into superstardom. The Croatian playmaker can do just about anything from midfield, because his 90 Passing and 91 Dribbling ratings are among the best in the game. Few players can change a match in an instant with a perfect pass or a long-range rocket shot like Modric can. Kevin De Bruyne (Machester City):Yet another exceptional Belgian making his mark at the highest level, De Bruyne runs the show for Manchester City and played a huge part in the reigning champions’ title run. His 92 Passing is his greatest asset as a playmaker, but De Bruyne is also wildly elusive on the ball with his 87 Dribbling, so he’s always finding himself with options. And whether taking a direct free kick or taking a shot from open play, De Bruyne is an elite finisher who boasts an 86 Shooting rating. Eden Hazard (Chelsea):Another well-rounded player whose abilities make him dangerous in any attacking role, Hazard is a winger by name—but he’s likely to wreak havoc on opponents wherever he happens to pop up on the pitch. The Belgian always manages to find space that didn’t exist before, using his speedy 91 Pace and classy 94 Dribbling ratings to open up any game for himself and his teammates. Sergio Ramos (Real Madrid):Currently the top-rated defender in world football, Ramos spent his early career as a right-back. But it was when he transitioned to center back that the Spaniard cemented his place in the sport’s upper echelon. Ramos has a commanding 91 Defending rating, which manifests in his exceptional leadership, perfect tackling, and aerial expertise. Luis Suarez (FC Barcelona):The incisive central striker in Barcelona’s system, Suarez constantly frustrates opponents with his elusiveness on the ball (87 Dribbling) and his strength (85 Physical), which keeps defenders at arm’s length. But the Uruguayan’s finishing is also among the highest in the game (90 Shooting), and the sight of Suarez with the ball is enough to haunt even the most experienced defenders’ nightmares. David De Gea (Manchester United): The world’s highest-rated goalkeeper has the best nerves in the business; his 94 Reflexes and 90 Diving ratings mean that it will take more than a decent shot to catch him off-guard. Years of experience at the highest level have also honed the Spaniard’s superb 88 Positioning, and he has become one of the finest at distributing the ball with his foot, thanks to an 87 Kicking rating. 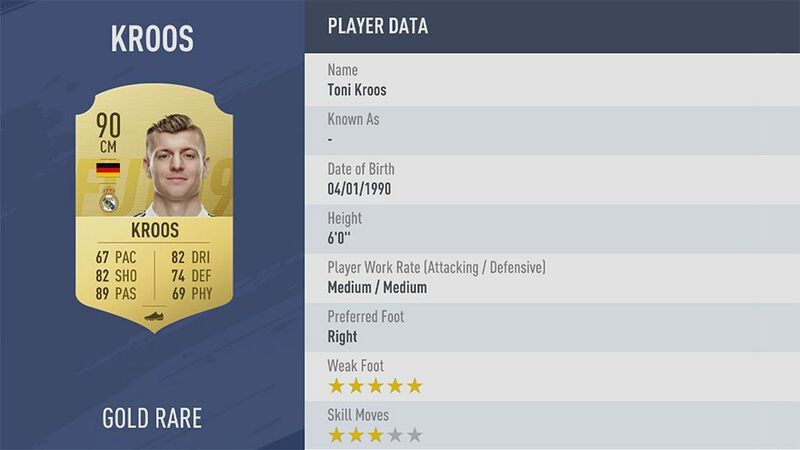 Toni Kross (Real Madrid): The engine that keeps the dominant Real Madrid machine running, Kroos is multiple ideal midfielders all rolled into one brilliant player. He can fire the ball with pinpoint accuracy anywhere on the pitch with his 89 Passing rating and create space for himself and teammates with his 82 Dribbling rating. Though he’s usually played central and deep, his technique on the ball and 82 Shooting rating make him nearly as dangerous when he finds himself closer to the box. Do you agree with the top 10? Let us know in the comments. For the full top 100, check out EA Sports’ complete breakdown. See how these players handle the pitch when FIFA 19 releases on September 28, 2018 for the PlayStation 4, Xbox One, Nintendo Switch, and PC.